Win new Richard Seymour and Alain Badiou books! We’re delighted to see Richard Seymour’s (aka Lenin’s Tomb) new book on our new masters The Meaning of David Cameron is out now with Zer0 Books. You can read a talk that Richard did on the book here. A short and pungent apologia for the Marxist categories of class and class war, which declares early on its intention to grate against the sensibilities of readers accustomed to the euphemistic treatment of such topics. The “meaning” of David Cameron, it turns out, is much the same as the “meaning” of any party leader situated within the neo-liberal consensus that unites “left”, “right” and “centre” parliamentary persuasions; which is to say that he is a cipher performing an established function within the apparatus of ruling class power. 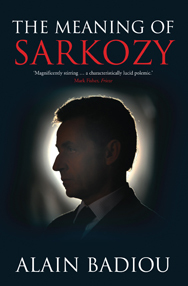 As Counterfire notes, Richard’s title is inspired by Alain Badiou’s The Meaning of Sarkozy, still available in hardback and out in paperback in August. In a powerful counter-blast against the monstrous regiment of “useful idiots” who, he says, have contributed in recent decades to the murderous mess of modern times, Seymour indicts not only the obvious suspects – the neocons – but the international cadre of liberal, left-leaning intellectuals and politicians, the “pro-war Left”, who supported the War in Iraq for professed “humanitarian” reasons. In anger as much as sorrow, he examines the tropes they defend, such as “civilisation”, “progress”, “democracy”, “freedom”, arguing that their attitudes amount merely to an assertion of the status quo, supportive of neo-imperialism, Islamophobia and exploitation. COMPETITION – UPDATE: WE HAVE A WINNER! 1.) Who is the Red Tory? 2.) Which co-author of Slavoj Zizek did he study with? 3.) And name the new book where said co-author (i.e. the answer to number 2) engages with Badiou. We will accept the first email that includes all 3 correct answers. Competition open only to those outside North America. THE COMPETITION IS NOW OVER. Broonland: The Last Days of Gordon Brown by Chris Harvie. Good Riddance to New Labour by Tony Wood. The Occupation: War and Resistance in Iraq by Patrick Cockburn. Meltdown: The End of the Age of Greed by Paul Mason. The Liberal Defence of Murder by Richard Seymour. First as Tragedy, Then as Farce by Slavoj Zizek. 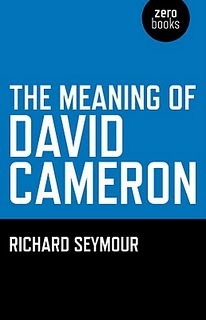 On Wednesday, May 26, 2010, Richard Seymour, blogger of Lenin’s Tomb fame, and author of The Liberal Defence of Murder will be in store at Housmans Bookshop discussing his latest publication, The Meaning of David Cameron. The Tories are posing as a ‘progressive’ and ‘radical’ alternative to New Labour. Drawing from George W Bush’s ‘compassionate conservatism’, they maintain that the ‘Big Society’ can do what ‘Big Government’ cannot – produce a cohesive, mutually supportive, happy society. Cameron’s court intellectual, Philip Blond, maintains that this if David Cameron’, which s a viable alternative to the failures of the egalitarian left and the excessively pro-market right. But is this more than campaign mood music? And are the conservative traditions that they draw on – from the bucolic, pseudo-medievalism of G K Chesterton to the anti-statism of Friedrich Hayek – really a bulwark of progress and radicalism? Richard Seymour argues that such ideas can only seem ‘progressive’ in light of New Labour’s acquiescence to Thatcherism. To understand the Cameronites, it is necessary to understand how the social landscape and corresponding political language was transformed by the collapse of post-war social democracy and its more radical competitors. To resist the Cameronites, he argues, it is necessary to attack the neoliberal consensus on which all major parties found their programme. The 2010 General Election: Will it Mean anything at All? UEL staff are joined by two leading political commentators to discuss the issues. Anthony Barnett, founder of openDemocracy.net and editor of the Our Kingdom blog. See his recent article for New Statesman at http://www.newstatesman.com/uk-politics/2010/03/labour-brown-british-britain. Richard Seymour, author of The Liberal Defence of Murder and blogger at Lenin’s Tomb. For further information, click here or email to j.gilbert@uel.ac.uk. Following the election on 6th May, Goldsmiths is planning a new series around the question Is Democracy Possible Here in the UK?. with Angela McRobbie (Goldsmiths, author of The Aftermath of Feminism, 2009) and Colin Leys (Goldsmiths and Queens University, Ontario, author of Market-Driven Politics, 2000). with Jeremy Gilbert (UEL, author of Anticapitalism and Culture, 2008), Alice Mattoni (European University Institute, Florence) and Samuel Toledano (International Visiting Fellow, Goldsmiths). Both 5:30pm Goldsmiths main building RHB 309. For more details, click here or write to Nick Couldry, n.couldry@gold.ac.uk. Plus on April 29th Luc Boltanski and Nancy Fraser in discussion on Capitalism and Critique – Goldsmiths main building RHB 309 5-7pm, followed by drinks reception. For more details click here or write to Kate Nash k.nash@gold.ac.uk. at School of Oriental and African Studies, Thornhaugh Street, Russell Square, WC1H 0GX – Room FG06, Russell Square Campus. This seminar is free to attend and open to all. For more information phone 020 7819 1177 or email isj@swp.org.uk. Richard Seymour lives and writes in London. His website Lenin’s To mb comments on issues such as imperialism, Zionism, Islamophobia and anti-capitalism, and covers strikes and protests with footage, images and reportage. Some of Richard’s earlier articles on racism can be found at the ‘lenin’s tomb’ blog, available online at http://leninology.blogspot.com/search/label/racism. He is the author of The Liberal Defence of Murder. 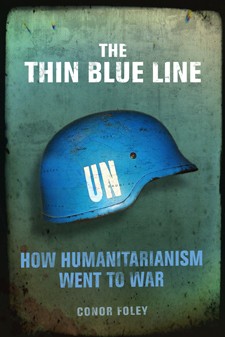 Conor Foley’s excellent book The Thin Blue Line : How Humanitarianism Went to War is written from a very different standpoint to the other three….Foley provides a composed but withering account of [humanitarian] interventions that will shock even those already predisposed against them and give pause for thought to those such as Hitchens who advocate military action for humanitarian purposes. Full article available (to subscribers only) here. Extract here. Ariane Koek, a Clore Fellow and writer, reviews Richard Seymour’s The Liberal Defence of Murder, for Resurgence, a magazine to promote ecological sustainability, social justice and spiritual values. 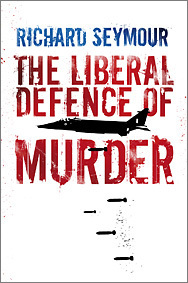 The Liberal Defence of Murder marks the debut of a significant left-wing historian who displays a welcome critical engagement, meaningful intellectualism and unabashed factual analysis. The review appears in the Resurgence magazine, issue 259, March/April 2010. Richard Seymour lives and writes in London. His website Lenin’s Tomb comments on issues such as imperialism, Zionism, Islamophobia and anti-capitalism, and covers strikes and protests with footage, images and reportage. It has been cited in, among others, Private Eye, the Guardian and Slate.